56 y/o M with PMH significant for MR, asthma, schizophrenia, bipolar, involuntary movment d/o, nonverbal at baseline, compliant with all meds, BIBA from group home p/w SOB X3 hours, constant, associated with wheezing. 1. What are your top differential diagnoses for shortness of breath? 2. What ultrasound exams can you perform to help differentiate shortness of breath? 3. What is abnormal in Figure A? 4. What is abnormal in this video clip? Top differentials for for shortness of breath include: CHF, COPD, PE, Pericardial Tamponade, Pneumothorax, Asthma, MI, and Infectious causes (Pneumonia). To help differentiate the causes of shortness of breath you can do a lung exam, pneumothorax exam and a cardiac exam. In a Lung exam you use the Curvilinear probe to look at 4 areas of the lung on each side to look for B lines indicating CHF or pleural effusions. You can also use the curvilinear probe in the apices of the lung and look for a pnuemothorax. During a cardiac exam you look for pericardial effusion, heart contractility, RV dilation and RV collapse to help with your differential. To learn more about the lung exam Please look back at Case 17 or Case 5. In figure A, you see a pericardial effusion. In figure B, you see a pericardial effusion with RV collapse indicating pericardial tamponade. 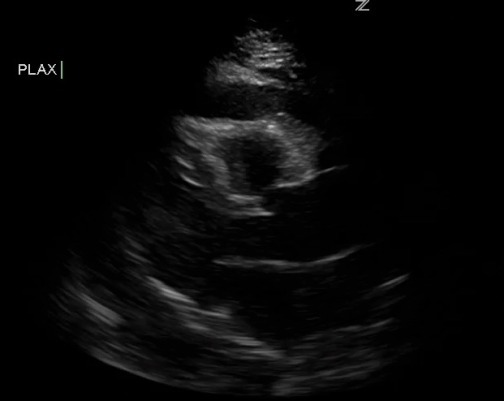 A pericardial effusion can be noted as an anechoic stripe surrounding the heart. Effusions should be circumferential. In the parasternal long axis view, an anechoic stripe that crosses the midline between the pericardial sac and descending thoracic aorta is a pericardial effusion. An anechoic area below the descending thoracic aorta that does not cross the midline is a pleural effusion. Pericardial effusions can result in hemodynamic instability as the pressure of the fluid collapses chambers. The right atrium and ventricle are low pressure chambers more inclined to collapse in comparison to the left atrium and ventricle. Right atrial collapse in late diastole is sensitive and specific for pericardial tamponade where as right ventricular collapse is very specific for pericardial tamponade. Our patient the in the case outlined above was hemodynamically stable and went from the ED to the OR for pericardial window, which is the definitive treatment for cardiac tamponade. However, patients who are not hemodynamically stable need immediate treatment including: 1) IV fluids and 2) a bedside pericardiocentesis to help relieve pressure off the heart. Definitive treatment will still be a subsequent pericardial window by cardiothoracic surgery. Jung, Hae-Ok. Pericardial Effusion and Pericardiocentensis: Role of Echocardiography. Korean Circ J 2012;42:725-734.